Albany Bulb is a strip of land jutting out from the southeast edge of the San Francisco Bay. This piece of earth, however, is not naturally occurring: It is the accumulation of a hundred years of rubble. To some, the Bulb is simply a scenic place to walk their dogs. But for others, it has grown to represent something more meaningful. “It’s place that reveals so much about the Bay Area, about nature, about art, our society, our failure to take care of people sometimes,” says Susan Moffat, a project director at a UC Berkeley Initiative who has known, loved and advocated for preservation of the Bulb’s prolific art and culture for over a decade. Going on three decades, the Albany Bulb has been a point of conflict, even tangled in a number of legal battles. Now, the area is at an important transition point. It is about to be integrated into McLaughlin Eastshore State Park, and a big question remains: What kind of park will the Bulb become, and will new management effectively preserve the site’s distinct culture? The Bulb was created in 1963 as a landfill. The area had been broken down to build a nearby racetrack: rubble from the explosion filled the small bay, at which point the city decided to use the land as an area to dump construction materials. Due to the efforts of some environmental activists, the landfill was closed after about 20 years. The rubble peninsula became somewhat of an unclaimed territory after the landfill was shut down, and so a community of homeless people, who came to call themselves “landfillians,” established itself. 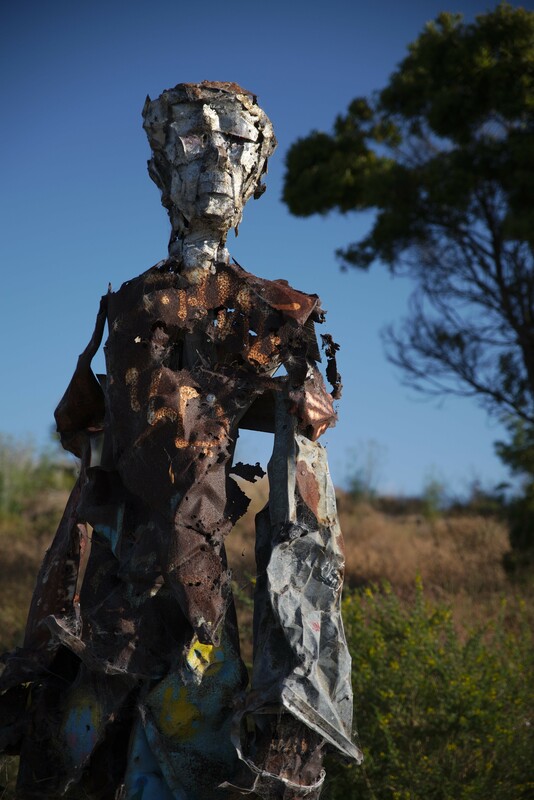 Groupings of makeshift houses sprouted up on the Bulb, constructed by campers with names like Jimbow the Hobow and Boxer Bob, and art thrived: wiry sculptures with spinning parts and colorful graffiti dot the concrete and rebar-filled landscape. As the city geared up to clean up the land and transition it into state park, it went forward with plans to move out the group of people camping out on the waterfront illegally. Albany spokesperson Nicole Almaguer noted that the city developed a program to work with the campers. “We didn’t simply kick them out,” she said. In the process of ushering people out of the encampment on the Bulb, there was a group who found the temporary shelter offered by the city insufficient, and instead sought legal action. Ultimately, after reaching a settlement where the evictees received $3,000 each, the city transitioned 29 of them into an alternative-housing space through a nonprofit agency, Berkeley Food and Housing Project. Even though the people are gone, some of the art remains at the site: the transition plan — developed after lengthy and fraught discussions between the city, the East Bay Regional Park District, and invested community members — acknowledges that preservation of the art is important, but some study and planning of how that art will look and how it will be maintained is a process that’s underway. The city will begin an environmental review in the next several months. Moffatt points to the eviction as a painful part of its history. Though some stakeholders, such as the group Citizens for East Shore Parks, prioritize the environmental preservation of the shoreline, Robin Lasser, who curated an exhibit documenting the people and art at the Bulb, believes that history should not be forgotten. Moffatt and the group she works with aims to ensure the history and the physical memories of the Bulb are not erased as it is cleaned up and transitioned. She meets with a group the first Sunday of every month, to experiment with continuing an environmentally sustainable tradition of art at the Bulb. “We don’t want it smoothed over and turned into a lawn or into a conventional park,” Moffatt said. This year’s theme is ‘Sankofa,’ which explores revisiting what has been left behind to strengthen the community. Supporters say it makes no sense to close the clinic.